Used register app from WEBSITE, they emailed back next morning with verification and a request to call back. GREAT! We RVed from Lacey Wa, to Cal, to Phoenix, to Killeen, to Pocola,, to St Louis, to Cambridge then across 94, 90, the best place was the SUNCREST. Facility, Restroom, Appeal, personnel, park layout. From the screwed up registration to the water sprinklers going off on two different occasions while sitting outside getting soaking wet. Complaining to the front desk and having the same happen the next day to the dirty men's room floor this place is not a resort by any stretch of the imagination. At this point I have traveled from Florida to Canada across the top of the United States to Washington some 5000 miles and this is my worst experience to date. 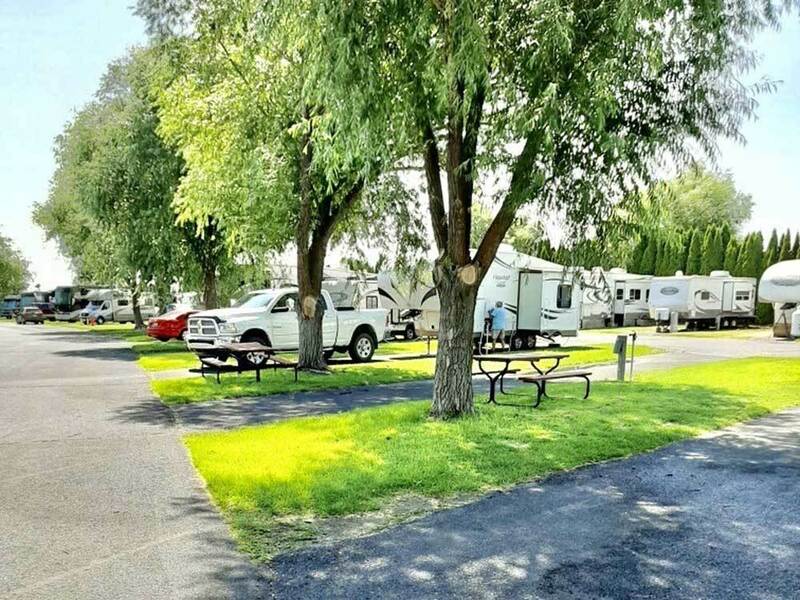 Suncrest RV Park, Moses Lake WA. Well appointed, clean, friendly staff at check in, close to RT 90- easy off/on, nice laundry and two pools (one with two slides). The only drawback was how close the sites were. It felt like we were on top of the other guests (the park was packed, I only saw one open site). No firepits, but I did see (and smell) grills cooking. This was just a one night stop for us and it worked great for that with all the services they had. Very nice facility with pull thru spaces and full hook ups. The sites are paved and level. There are two pool areas: One is a three section pool with a depth of about 3.5 feet. The other pool area has two gentle water slides. The pool seemed to be clean. The spa mentioned in earlier reviews has been removed. The bathrooms are located in the main building. Both men’s and women’s bathrooms have three shower stalls with a common dressing area separated from the main bathroom by a curtain. There is a gazebo located on top of a hill overlooking the campground which gives a nice view of the surrounding area. It is easy to mistakenly turn beside the campground and miss the entrance by turning too early and a well worn turn around area shows how frequently it happens. The vast majority of the sites seem to be occupied by seasonal or long term residents. There is plenty of green space for children to play. Be aware that an automatic lawn sprinkler system waters the grass at night (and anything else left out). Stayed here one night, 8/13. Decided to pay the $47, w/GoodSam discount for the pool. It was the same as the June 2016 review, pool water not clear,somewhat cloudy, with visible junk on the bottom. The spa, still green, at least had a "closed" sign on it; however, it was still running and the water was hot. The pool and spa were DISGUSTING; just seems like laziness on the owners part. Dumpster over flowing with trash - there was plenty of room for a second dumpster during peak summer occupancy. No cable! Men's bathroom/shower was extremely hot and humid in the late afternoon. Shower stalls had curtains, but it was a common dressing area - no privacy. I slipped and almost fell on the wet floor in front of the sinks. Now for the positives... The pull throughs were good sized with shade trees. Nice grounds - lots of grass; kids in the park had plenty of space to play and ride bikes. However, overpriced for not having pristinely kept pool and spa, and lack of cable for almost $50 dollars is unacceptable. I will not be staying here again and cannot recommend it to others. Good Sam needs to seriously review their rating of this park. My wife and I, seniors, have been in parks rated in the 7s and 8s that were far superior to this one. Sorry to be so negative, but Suncrest Resort, in it's current condition does not deserve a high rating. It could and should with a little more effort by the owners. Upon arriving after we set up camp site we went to pool the hot tub was green and Luke warm. We atayed for 5 days and everyday the hot tub was cold green and dirty everyday. The pool was also dirty every day. They told us it was because they just put water in the next day it was still cold and still green they told us it was because system was built in 1989. They say on their website no tents people have tents they say no camp fires people have camp fires. Dogs off leash and in pool area. We have cloths hanging on cloths line and they come by and tell us to clean up we look like a trailer park. Talk about insulting 4th of July watching fireworks on hill that they told us about the firework show on moses lake, but they didnt bother to turn off sprinkler and during show we got wet. Ruined our night. We have finally had enough and wanted to check out early and even with 24 hr notice they won't refund our money, false advertising should be enough to get money back. Very disapointed they used to have a store and game room for kids and they made into apartments. The bathrooms are locked during day. Good sams should be ashamed to advertise this camp site.